A few months after the BP oil spill ravaged the Gulf Coast in the spring of 2010, Louisiana’s Abita Brewing Co. announced a homebrew contest. Hundreds of recipes came in from around the country. Yoes submitted his recipe for the Louisiana Imperial Oyster Stout, which had notes of caramel and roasted chocolate, and locally shucked oysters that were added directly into the kettle. Lo and behold, it won the contest and was brewed as a limited release in 2012 and 2013. This October 2015, it will be bottled, become a part of Abita’s regular line and renamed Bad Mother Shucker. In fact, Abita is just one of many breweries in the U.S. that have helped spawn the resurgence of oyster stouts. Once just considered a good pairing for the working class, bivalves and dark beer are now being combined in an ever-growing style. Because of aquaculture—growing shellfish in an oyster farm or hatchery—and the rising popularity of oysters, the unlikely practice of inserting oysters into stouts is popping up all over coastlines—inspiring brewpubs, festivals and even environmental partnerships. But, in true American brewing spirit, there’s not just one right way to create an oyster stout, and experimentation is the name of the game. Oysters, in general, are odd creatures. They start out as free-swimming larvae that look for something to cement themselves to, and shells are their preferred substrates. The oyster population was threatened in various regions of the country in the mid-20th century, due to overharvesting and naturally occurring diseases. But aquaculture was developed around the 1970s and has since revived the oyster population. 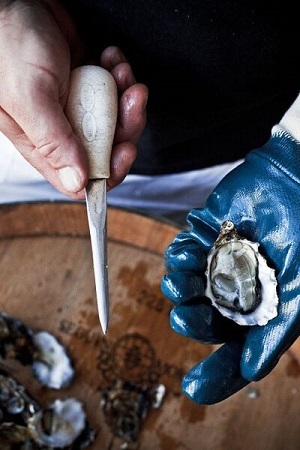 Basically, baby oysters (or spat) are farmed from seed in temperature-controlled water. As the oysters mature, they are then placed in cages in the water that re-create natural oyster reefs. They grow over several months before being removed, cleaned and distributed throughout the country. All the while, they are doing their part by filtering the water. This growing availability, of course, has led to increased awareness of the oyster as a food source, even if it still is considered an acquired taste. For example, Hog Island currently grows four types of oysters: the smoky-sweet Sweetwater, the mineral-flavored Atlantic, the buttery Kumamoto, and high-in-iodine French Hog. Of course, the relationship between oysters and stouts started long before its recent spike in popularity, as historians trace the marriage back to 19th-century England. As far as the shellfish actually being inserted into the beer, according to Jackson, in 1938 London’s Hammerton Brewery was the first to brew a stout using a canned oyster concentrate manufactured in New Zealand, with the thought being it would provide added nourishment, like lactose added to a milk or cream stout. There was also the idea that oyster shells acted as a natural fining agent to clear beer in the days before filtration. As pale ales became more popular in the mid-20th century, the oyster stout tapered off for decades, but then enjoyed a revival in Great Britain during the ’80s at breweries like Bushy’s and Marston’s. It took a little while longer, however, to get started back in the States. That was until some larger breweries caught onto the style, researched the history and decided to play around with it on a larger scale. For other coastal areas, it was a matter of tradition. Carolina, his general manager came back from a shucking tournament raving about a home-brewed oyster stout. 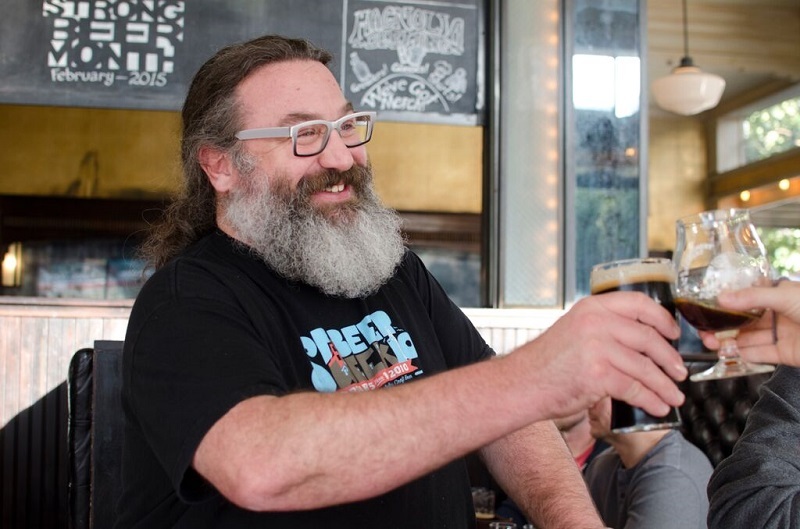 In 2008, he founded Oyster House Brewing Co. in Asheville and now flies in fresh oysters from around the country to brew two varieties, the dry Irish stout Moonstone and the Imperial stout Super Moon. “It’s fun to get people in the door who may not normally try oysters, but are willing to sip the beer and end up loving it,” he says. With the oyster farm industry thriving, the rest of the beer industry soon followed suit and oyster stouts began debuting all along American coastlines, including Flying Fish and Upright Brewing in 2009, Flying Dog and Hen House Brewing in 2011, Abita and 21st Amendment in 2012—just to name a few. According to brewers interviewed for this article, the key is emphasizing that the stout pairs well with oysters, but doesn’t taste exactly like them. That flavor, of course, all depends on the brewing process. 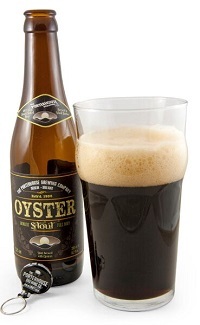 And it seems like no two breweries are alike when it comes to creating their oyster stouts. Some, like Abita, just use the oyster meats and juices, which it adds to the kettle with salt water to create its imperial oyster stout. However, most seem to put whole oysters in the kettle and have come up with some innovative tools so the shells don’t interfere with the brewing equipment. For Flying Dog, it’s a stainless steel basket. For Flying Fish and Magnolia, it’s mesh bags. At HenHouse, it’s a gradual process, in which the sea salt (which is harvested off the Mendocino Coast) goes in at the beginning of the boil, followed by shells halfway through and then finished with a half-pound per barrel of whole oysters to create its Oyster Stout. Brewmasters can all agree that most of the briny flavor comes from the shellfish’s juice, known as liquor, which gets released once the oyster is cooked a bit and opens up in the whirlpool. To be clear, McLean’s staff doesn’t eat the oysters that have come out of the wort at the end of the boil. He learned that the hard way. However, he gets enough additional oysters on brew day for restaurant staff to shuck and eat them while they brew, throwing the shells in the kettle as they go, which has become somewhat of a tradition at Magnolia. The taste and quality of the actual oysters are crucial, as brewers try to get them right from the boat or seafood market, or at worst overnighted, and oystermen provide a hefty product with bold flavor. 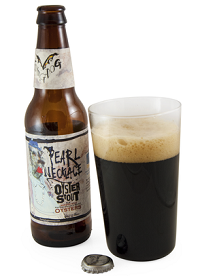 In Flying Dog’s Pearl Necklace Oyster Stout, a dry stout with roasted character, it’s all about Rappahannock’s Olde Salts, which are grown in the Atlantic and have a higher-than-average salinity level. Oyster salinity is measured on a scale of parts per thousand, from 5 to 35 ppt (0.5 percent to 3.5 percent salt by volume) and an Olde Salt clocks in at 30 ppt. Beyond the great taste and quirky marketing of oyster stout as a style, a lot of the brewers’ motivations stem from something entirely more important. “For me, it was a nice way to say our seafood is still safe,” says homebrewer Yoes, who was able visit Abita for the first brew and is excited to see his creation bottled this fall. That local pride and sentiment are echoed in breweries throughout the country, including Flying Fish, whose “Exit” series was based off the idea of making a beer to represent every exit of the New Jersey Turnpike. Exit 1, which is right on the Delaware Bay, inspired its Bayshore Oyster Stout, flavored with English chocolate. A portion of the proceeds from Flying Dog’s Pearl Necklace (brewed with oysters from Rappahannock Oyster Co.) are donated to the Oyster Recovery Partnership, which plants oysters back into the Chesapeake Bay. The idea of partnering with a nearby environmental organization is something with which Flying Dog is very familiar. 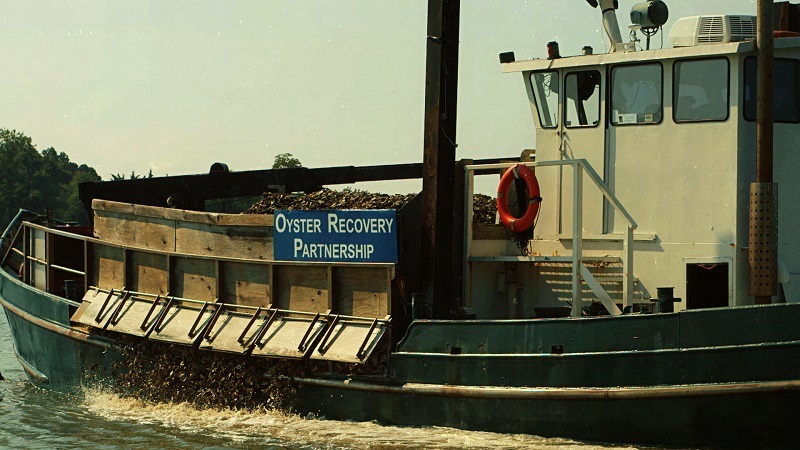 Not only does the brewery get its oysters from Virginia purveyor Rappahannock, but also a portion of the stout’s proceeds (and leftover shells) gets donated to the Oyster Recovery Partnership, a nonprofit that plants oysters back into the Chesapeake Bay. Inevitably, that message gets passed along to consumers, who may not have had any idea they liked oysters, let alone how important the creatures are to the environment. Among the brewpubs, festivals and partnerships, it seems obvious that the oyster stout is here to stay. The style also has that alluring element of surprise, and as beer drinkers get more sophisticated and adventurous, the demand for out-of-the-ordinary beers only grows. With the advent of seafood farming, the oyster stout can now be produced year-round, but most brewers agree that consumers crave dark beers in the fall months (“No one wants a stout in the humid, Louisiana summer,” explains Wilson)—so it’s usually a seasonal. 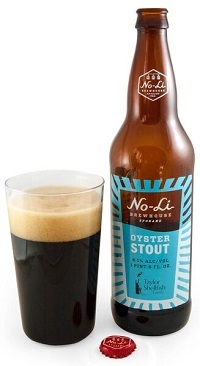 The most common style of beer to be brewed with oysters is the stout, but there have been a few exceptions, including Night Shift Brewing’s Harborside gose with oysters and coriander; Daughters of Poseidon, a black IPA brewed by DC Brau with Baxter Brewing Co.; and Earth Bread + Brewery’s Earth Blind Oyster Ale, made with only shells. In fact, putting oysters into a different style of beer is something that McLean from Magnolia has pondered for a while. Jess Mayhugh is the digital editor of Baltimore magazine, where she covers drinks and sports. Her work has also appeared in Thrillist, Serious Eats and BeerAdvocate. She prefers her beers sour and will challenge anyone to name a more beautiful ballpark than Camden Yards. See also Booth’s brewing manual from 1829 in which he mordantly explains that the drinker can take his pick between a sourish flavour in beer and one characterized by a peculiar bitter taste formed by the action of lime carbonate in oyster added to the drink. (Oyster shell is mostly lime carbonate). Many other substances were used to this end including marble dust. 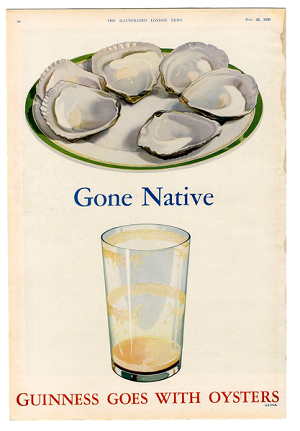 In time, the association between oyster and beer in this sense led people to pair them as food and drink, and finally to add oyster meat to the beer. I never felt oyster and beer have a particular affinity – many will disagree, I know – and consider the practice emerged from this old technological, rather than culinary, link between oyster and beer. The Crown Cork & Seal ad referenced in the article which recalled this old practice of using oyster shell to correct acidity put its finger on it, IMO. No “in time” about it. Whilst North Americans might look to technology as an explanation, Europeans will tend to look to history and geography. Whitstable has been the centre of oyster production in England for 2000 years, and it sits in the middle of East Kent, which has been the main centre of hop-growing in England since hops came to England in the late Middle Ages. So in one place you had the peasants eating oysters as the cheap food and beer as the cheap drink – there was no artificial “pairing them as food and drink”, that was just what was available to poor people in that area. Beer and oysters were the burger and coke of the 18th century – there’s several extant London pubs and restaurants (eg Rules) that started as oysterhouses around that time. London was just down the coast from Whitstable and imported oysters by the million. As the London porter style emerged, that was what was drunk with the typical street/pub food – oysters. So if you’re not quite feeling oysters with stout, I’d suggest you try them with something more like porter than a classic dry stout – one of the main justificitions for oyster stout is that Guinness just isn’t quite right. 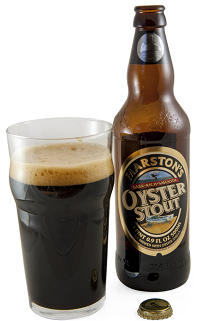 You’re right that the idea of putting whole oysters in beer probably originated in people using ground oyster shell to counter acidity, but in the UK the debate continues whether an “oyster stout” contains oysters or is designed for drinking with them. You see both, but FWIW the Kent breweries tend to go without oysters in the brew. The Whitstable Brewery is part of the Whitstable Oyster Co and brew a pretty decent one – don’t confuse it with the Whitstable Bay Brewery which is Shepherd Neame’s craft label. The Shepherd Neame version isn’t bad, and there’s a better chance you may see it in North America as they have a distribution deal with Sam Adams.